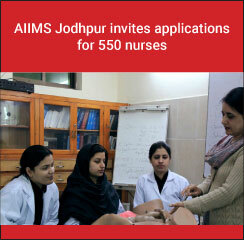 The All India Institute of Medical Sciences (AIIMS), Jodhpur has announced as many as 550 Staff Nurse Grade II vacancies. The online application procedure for AIIMS Jodhpur recruitment 2016 for nurses has started on September 24 and last date for submitting application form is October 23, 2016. The details on AIIMS Jodhpur recruitment 2016 like eligibility criteria, selection procedure, important dates and how to apply are given below. (iii) Should be registered "A" Grade Nurse and Midwife with a State Nursing Council or equivalent qualification for male nurses. Selection Procedure: Candidates will be shortlisted on the basis of their performance in written examination. Applicants can check the detail of exam pattern from the official notification. Candidate should read the instructions in the advertisement and online application form carefully before making any entry or selecting any option. Candidate should enter all the required details while filling up the on-line application form.